If you have lived in Downey, California for any length of time, then you know that the freeways and highways in our suburb of Los Angeles can get extremely busy throughout the year. With the large amounts of traffic and small amount of rainfall that the area sees throughout the year, there can be a larger amount of debris on the roadways than one sees in other parts of the country. Unfortunately, a big negative is that this material gets airborne and can result in damage to the windows of automobiles ranging from small chips and cracks to fully broken windows. If you find yourself in this situation and need to find a quality auto glass Downey repair shop, then you should look no further than Downey Mobile Auto Glass. Our company has been serving the local area for more than 12 years and counting now, and we are experts in our field. Whether you need a quality auto glass replacement service, or a more basic window tinting service, our team is here to take care of your needs. Our company provides all of our auto glass services via our mobile repair teams. We are experts in bringing a fully equipped auto glass shop to our customer's desired location throughout the local area. You will never have to worry about our team showing up to a job site and having to come back to the main garage to pick up tools, parts, or materials. We also take great pride in ensuring that all of our technicians are both trained and certified to work on car windows of all makes and models of both foreign and domestic automobiles. This helps ensure that you will enjoy the highest degree of craftsmanship along with our high-ranking levels of customer service during our business relationship with each other. Our mobile repair teams will simply amaze you with the quality of our work, and you are guaranteed that we will never surprise you with any extra surcharges or fees on the final bill that you get from our company. We are here to please, and we will always ensure you know what our teams are doing or plan to do to repair your auto's glass. Early in our company's history, we also found a big demand for delivering mobile tinting services to our customers. We expanded our company to cover this and just about any other auto glass need that you might have so that we can save you time and even money by sticking with one service provider to take care of 100% of your auto's needs. Our technicians are trained in all service options, and we will always ensure that you are aware of the expected timeline our teams will be following for everything from a basic windshield repair to a full glass replacement service. If you have any questions regarding what Downey Mobile Auto Glass can do for you, please give our friendly staff a call today. We love to talk shop, and will always take the time to answer any questions that you might have for us regarding our auto glass services. We look forward to working with you, and our team will always provide you with a free estimate on any service that our mobile teams are capable of delivering. 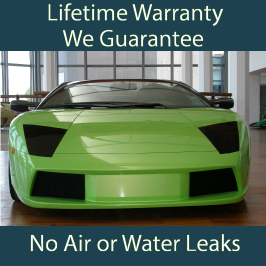 All work accomplished by our company is also covered under our rock-solid, 100% warranty. We look forward to working with you today. One of the most critical components in modern automobiles when it comes to ensuring the safety of auto passengers is the windshield. Today's vehicles are designed to use the strength of the glass to help with both proper airbag deployment as well as maintaining the "safety bubble" within the primary cabin of the automobile. When an auto windshield gets damaged beyond repair, there is an increased risk of improper airbag deployment. Additionally, a severely damaged windshield creates an increased probability of the car frame failing in the event of a horrible rollover accident. As a result, it is critical to seek out a quality windshield replacement service as soon as one's windshield becomes damaged beyond the point of repair. If you find yourself in need of a high quality service provider who can perform this service, then you should look no further than Downey Mobile Auto Glass. Our company has been in business for more than 12 years delivering mobile auto glass repair services, and we know how to get the job done. Every one of our mobile repair technicians is highly trained, licensed, and certified to work on our customer's auto glass at areas throughout the city for our customer’s convenience. We do not charge an extra fee for bringing the auto glass shop to your desired location for a windshield replacement or other auto glass service, and all of our work comes backed by a 100% warranty. Many times, our company has prospective customers give us a call asking how long they can put off getting the windshield replaced on their automobile. Our answer is always to do the job as quickly as possible due to the major safety concerns with driving without a fully in-tact windshield. Unfortunately, many consumers will simply settle for the cheapest service provider that they can locate through a basic Web search. This typically results in finding a service provider who does not invest time and money in the qualifications of their technicians and possibly the use of unapproved auto glass for the job in order to reduce the overall cost of the service. Although the new glass may look good for a time, it is likely to fail or in the best case have a number of leaks or other annoyances when it does rain or you take the vehicle to the car wash. At Downey Mobile Auto Glass, we guarantee that you will never have these worries when you make the smart decision to hire us to take care of your windshield replacement needs. Our team has honed their skills over the past decade +, and we have built our experience base on just about every make and model of both foreign and domestic automobile on the market. Whether you drive a luxury sports car or simply an everyday driver, our technicians know how to get the job done correctly on the first try. If you find yourself in the position of needing to get a new windshield in a quick timeframe, then Downey Mobile Auto Glass is here to help you. We often have our mobile repair teams available on short notice to respond to our customer's needs. Simply give us a call when convenient with your schedule and our staff will be more than happy to help answer any questions that you might have with our mobile repair services. One of the easiest ways to help make one's car stand out from the rest is to seek out a quality window tinting service. Not only will your car look much sleeker than before you got the service done, but it will also provide a number of big benefits to your vehicle helping maintain its value and nice look and feel of the interior over the long haul. Getting a quality car tint helps protect the interior of the automobile form the harmful rays of the sun which will keep the fabric from fading, and plastic or leather from cracking due to exposure to the sun's ultraviolet rays. If you live in the Downey or surrounding areas of Southern California, and have not had the opportunity to get your vehicle's windows tinted, then you should definitely give the friendly staff at Downey Mobile Auto Glass a call. Our team has been taking care of our customers in the local area for 12 years and counting, and we can tint the windows of just about any make or model of both foreign and domestic automobile on the market. All of our work is backed by the company's 100% warranty, and you will never have to worry about streaks or air bubbles appearing in the tint our expert technicians apply down the road. We believe in partnering with our customers for the long-haul, and want to build a lifelong partnership with you when it comes to taking care of the full range of auto glass needs that you might have. On the rare occasion that our service techs may have missed a small detail during the application of the window tint on your automobile, simply give us a call, and we will be more than happy to rapidly respond to your needs to correct the situation in a short timeframe. A common problem that we have seen at Downey Mobile Auto Glass during our more than 12 years of being open for business is that many of the newer car tinting companies simply do not know or enforce the state of California rules for tint darkness. In our state, the darkness of tint is measured by the total amount of visible light transmission (VLT) allowed to pass through the vehicle windows. Additionally, the windshield is only allowed to have non-reflective tint on the upper four inches of the windshield. The front side windows are allowed to have ting that allows up to 70% of the light to pass through, while the rear and back side windows are allowed to be tinted to any level of darkness the consumer desires. The same rules apply for both sedans and SUVs in the state, and there are no medical exceptions for exceeding these rules permitted in California. When you choose our mobile technicians to take care of your tinting needs, you can always be comfortable in the knowledge that we not only know what the state regulations are when it comes to auto tint, but that we will not put you in a bad position by tinting your windows darker than permitted by law. We will also review the various service package options that you can choose from when it comes to tinting your auto's windows to ensure we help meet your overall goals with getting the service for your automobile. Our staff is always happy to answer any questions that you might have regarding our mobile glass services, and we will always provide you with a free estimate on our work. No question is too simple to ask, and we look forward to serving you today. Downey Mobile Auto Glass provides excellent auto glass repair services in Downey California, Lakewood, Bellflower and surround areas. We have free mobile service anywhere in Downey CA. We are Downey Auto Glass - Downey Auto Glass Repair - Car Glass Downey - Auto Glass Repair Downey CA - Auto Glass Downey - Auto Glass Bellflower. We perform excellent Windshield Repair Downey - Windshield Replacement Downey. Our company also does Window Tinting Downey - Auto Window Tinting Downey - Car Tint Downey - Downey Window Tinting. Call us today for a free estimate on your mobile auto glass. We are known for excellent Auto Glass Repair Bellflower - Car Glass Bellflower - Windshield Repair Bellflower - Auto Glass Replacement Bellflower - Window Tinting Bellflower - Car Tinting Bellflower - Auto Window Tinting Bellflower. Call us today for you Auto Glass Downey CA. Our company is the best Auto Glass - Windshield Repair - Auto Glass Repair - Window Tinting - Car Glass - Windshield Replacement. We are your local Auto Glass Lakewood - Auto Glass Repair Lakewood - Auto Glass Replacement Lakewood. We are a fully mobile Windshield Repair Lakewood - Windshield Replacement Lakewood - Auto Glass Lakewood CA - Car Glass Lakewood. We come to you completely free of charge so call us today at (562) 340-6343 for fast, over the phone estimates.